Very few musicians ever attain the level of musicianship which allows them to honestly say that they make a living playing their chosen instrument. Richard Pryor however is one such person. Known as Pebbleman to many of his fans, he is one of the top Blues Rock guitarist in South Africa today. Now endorsed by Fender and one of only 3 in the Country he is a real force to be reckoned with. and with thousands of gigs firmly tucked away in his tool kit, Richard is a five-fingered fret feast to be reckoned with. He currently fronts and manages his 2 bands BOULEVARD BLUES and PEBBLEMAN. Richard also studied at UCT College of Music where he attained a Performance Diploma in Jazz Studies in 1993. 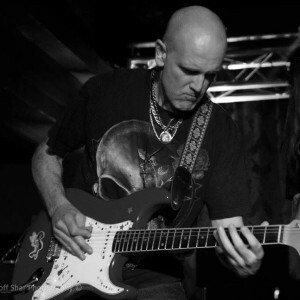 Richard is also a highly qualified Guitar Teacher and has been teaching for over 20years From humble beginnings his tuition has grown into a real business and a passion. The information and resource material that he has created and collected over the years is huge and this allows him to customize lessons for individuals from beginners to advanced, from young to old, from Blues to Metal and everything in between. Checkout his Tuition Page for more info. As well as teaching Richard does part-time session work and can be heard on numerous artists CDs from Afrikaans originals to Rock Dop Skiet and Pop Recordings. His Lessons are taylored to the individual’s needs. All material and backing tracks are provided. These backings are an invaluable tool for teaching especially improvisation and a cool way to learn and practice the songs, scales and Licks that he provides. This gives the student a chance to work through the backings and exercises at home on their own computer in their own time. Let’s see what the Lessons cover: All the good stuff…. specializing in rock and Blues, all the basics including scales, chords, strumming, learning songs etc. etc, Licks tabbed out for various backings and ‘riffs of the week’ exercises. Technical guitar Exercises using alternate, economy and sweep picking styles. Improve your speed with Speed Picking, Arpeggios and 2 handed Tapping exercises. Learn how to Improvise in any key and how to use what scales and notes over what backings. Theory and how to apply it practically to help understand and improve what you are playing….. Learn to play the Blues properly allowing yourself to play beyond just pentatonic and over each chord individually. Learn the 4 Different types of Blues and how to really solo over those I IV V progressions. Unlock the mysteries of the fretboard…….no more ‘sea of notes fretboard’…. know what notes to play in any key right across the fretboard. The modes, not just what they are or how to play them but how to really use modes in the real world and apply them to your playing. Help with song writing and construction. Learn how to use Harmonic minor, Spanish Phrygian and many other altered scales over backings on your Flashdrive and in your own songs. Learn the notes in any chord and learn Chord Construction and Theory. Learn Target note soloing, and Chordal improvisation. Right Hand picking excercises and altered time signature practice are among other things on the menu. Everything you wanted and didn’t want to know about Becoming a ‘Guitar Player of Note’ but haven’t asked yet. Advice and tips on playing live and getting a good stage and/or bedroom sound….. Advice on gear in general and how to tweak the gear you have. And a whole bunch of other stuff you never needed to know …… UNTIL NOW!! !